Love's Sorrow is FREE on Kindle!! Be sure to share this offer with your followers & cyber buds...it's only available for FREE download until Friday! Download your FREE ecopy from Amazon!! WHAT PEOPLE ARE SAYING ABOUT LOVE'S SORROW! "Do yourself a favor and buy this book. Put it on the top of your TBR pile and spend a day with Anne and Gavin. You will feel gutted, stunned and just plain open-mouthed in the end. Don’t say I didn’t warn you but this book is not to be ignored. Ms. Rochenski has written a brilliantly, in some ways brutal, book that everyone must read and then come back and cry with me. Only 7 months until the next book." "This is not a cookie cutter romance that can be found in every bookstore. I applaud Terri Rochenski for writing the truth about Love. It can be faked, and people learn everyday in all walks of life that they have been used by people that they thought loved them. I’m excited to see Anne’s journey continues with Love’s Revenge. It is a book I'll definitely read." "I have to admit when I read the blurb and first started reading Love's Sorrow I though it was a very well written but run of the mill historical romance, but don't be mistaken I do not at all regret reading this book in fact I am avidly awaiting the next installment and believe me if I could help Terri Rochenski in any way for it to be out earlier I would." 4 Stars! - Amazon Review"If you want a feel-good, not-too-realistic romance, don’t read this book. If you want a realistic depiction of London in the 1800s, society’s prejudices, people’s selfishness and love and all its agony, this is the book for you." And in case the ending leaves you wanting more, Love's Revenge, Means of Mercy #2, 1st chapter is listed as a FREE READ over at Roane Publishing! Embittered by betrayal, Anne MacKay flees London for America, where she learns she's pregnant with her abusive husband’s longed-for heir. In a society that doesn’t protect, or afford a well-to-do wife’s desire for divorce, Anne decides there is one way to exact revenge: deny the father any knowledge of his child. One unwise decision lands Anne in her pursuers’ clutches, tearing her from the ranch, her child, and her growing love for the one man who could redeem her from bitterness. She's left with no choice but to finally face her husband, knowing her freedom and life hang in the balance. Love's Sorrow, Means of Mercy #1, is on sale at Roane Publishing for only $0.99!! Click on the image for purchasing details. Join Terri Rochenski and 10 author guests for the Release Day Party on Facebook today from 9 am EST to 9 pm EST! Tons of prizes, snippets, and fun! Click on the image below for more information. and a $25 Amazon Gift Card! Love's Revenge has a face! Check out the new purdy!!! Love's Revenge Release Day Blitz and Blog Tour are now scheduling!!! If you're interested in hosting, please click on the tour button. As you can see, I had a ton of precious peeps climb aboard to help out! I appreciate you all taking the time to send interview questions, think up guest post topics, and setting aside time to help with the reveal of the entire first chapter. Happy Book Birthday Love's Sorrow! There's a paperback copy of Love's Sorrow up for grabs on Goodreads! Enter below & best of luck! Giveaway ends May 16, 2014. Check out the new purdy!! Finally get to share my new purdy!! For those of you who may have missed the news, I contracted my Means of Mercy series with Roane Publishing. This is the first, Love's Sorrow, and I must say that the cover artist kicked major bum in capturing the essence of this novel. Love's Sorrow is set to release on April 21st - less than one month away! If you're interested in hosting me during my blog tour, there's still time to sign up. Head on over to Roane's tour page. I'd love to visit! Purdy purdy purdy doncha think? BIG NEWS!! The first in my 'Means of Mercy' historical romance series is contracted!! Roane Publishing has offered me a contract for Love's Sorrow, the first book in my Means of Mercy series! 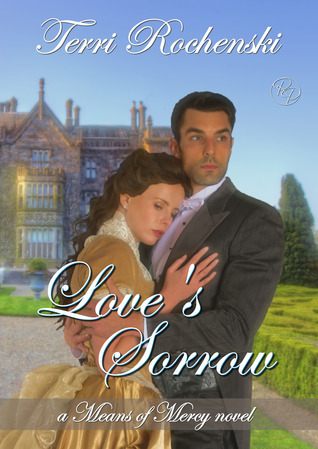 Love's Sorrow is an historical romance and the first manuscript I ever attempted. Right after the new year I decided to brush the dust off the CD it was stored on and give it a peek. Talk about an amateur attempt at telling a story! I laughed although the writing itself sicked me. I'll simply say that I now know exactly why Donald Maass had rejected the manuscript YEARS AGO due to it being "sloppy and Austin-esque". At the time, I had thought he didn't know what he was talking about. At the time, I didn't know who Donald Maass IS in the agent world. Talk about a major face-palm. After him-hauling for a bit, I sent Roane's acquisitions editor my pitch - and she simply said, "I WANT. Please and thank you." It's set to release April 21st! Yes, April 21st - of THIS YEAR! Needless to say, I'll be in the editing cave every spare second my little yummies allow. If you're interested in sharing in the cover reveal on Monday, March 24th, please fill out the following form. I would love to have you join in my dork dancing celebration! So excited to announce that I signed a contract with Still Moments Publishing for my first stand alone novella, Alone No More. It will be the first published story in their 'Unexpected Bumps' series. Set in the early 1800's of England Midlands, Alone No More is a story of innocence lost and lessons learned. An official blurb & cover will be posted once approved by SMP. Ebook & print publication is set for June 2013.